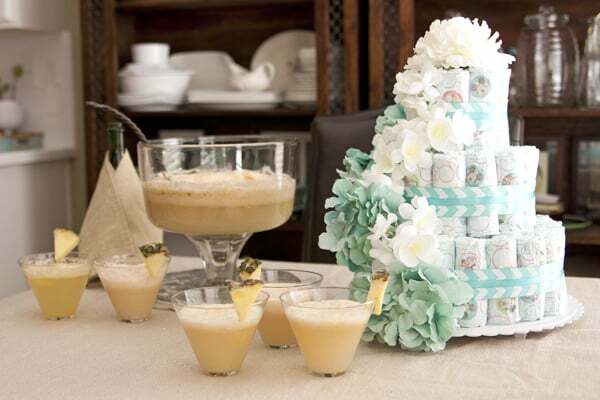 Are you hosting a baby shower anytime soon? If you are a sucker for entertaining like I am, then you will love this video. Have you ever seen or heard of a diaper cake? I had seen a couple diaper cakes at baby showers and always wondered how they were made. I actually thought they were all glued together and the diapers were unusable, but quite the contrary. The diapers are held together with rubber bands and/or ribbon and the mother-to-be can take the lovely centerpiece home for nursery decor or to pull out the diapers as needed for her newborn baby. Any mothers know that diapers are always a welcome gift. When researching how to make a diaper cake I turned to this video and this diaper cake tutorial from Pretty Providence. Luckily for me, my mom was visiting and took on this project. She is very crafty and loves to decorate cakes, so this project was perfect for her. 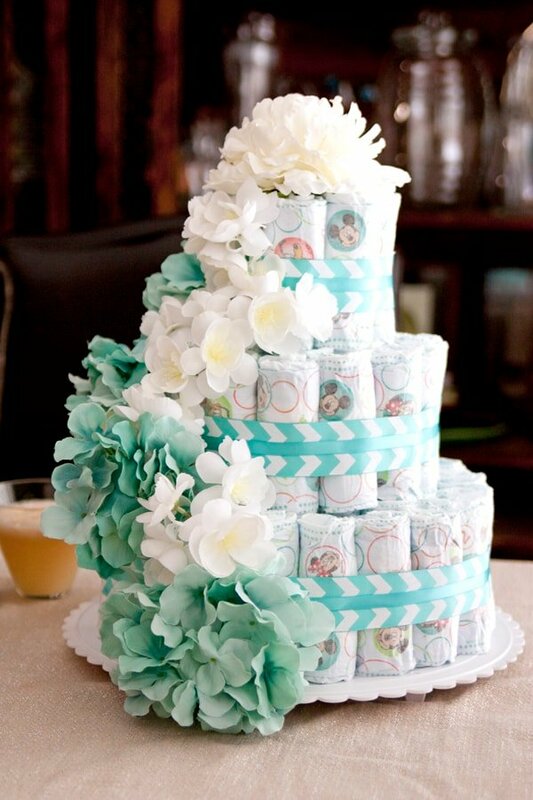 We purchased artificial flowers and ribbon and she decorated this Huggies diaper cake to perfection. As you can see by the example videos, a diaper cake can be topped with just about anything — flowers, toys, stuffed animals, paper pinwheels. The creative ideas are endless. 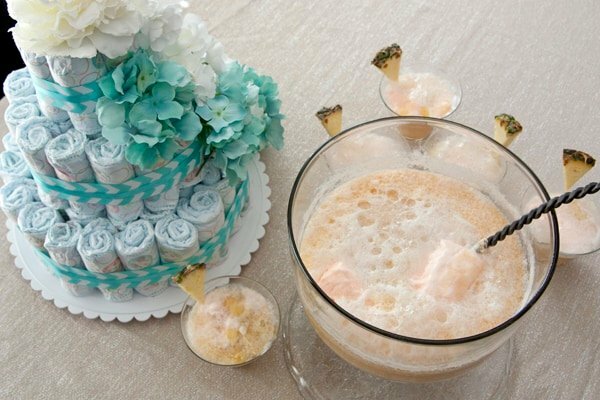 Growing up my family would serve a bubbly pastel colored sherbet punch every time they hosted a baby shower. When writing Latin Twist my co-author and I realized the punch has a name. It’s called ponche a la romana and it’s from Chile. 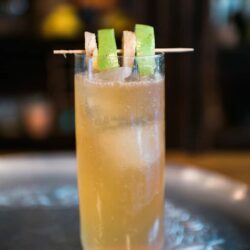 This version is made with pineapple sherbet, fresh pineapple juice, fresh pineapple, and champagne. You can make it with any flavor of sherbet, champagne, or with sparkling lemonade for a non-alcoholic version. With or without alcohol this punch is festive, delicious, and refreshing. 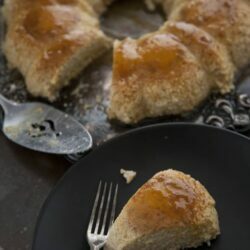 This ponche a la romana recipe can be found in the Latin Twist book and on Design Sponge. Be sure to follow Celebrate Family Values on facebook and twitter to download valuable coupons from participating Kimberly-Clark brands and for tips and tricks for everyday products like the Huggies diapers with adorable Disney designs I used in this video. Please keep in touch and subscribe to Muy Bueno and follow me on Twitter, Facebook, Instagram, Pinterest and subscribe to Muy Bueno on YouTube. 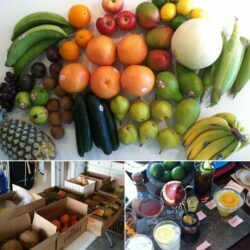 A special thanks to Kimberly-Clark for sponsoring this video and blog post.